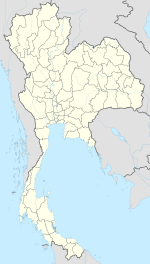 Chiang Rai (Thai: เมืองเชียงราย, pronounced [mɯəŋ tɕʰiəŋ raːj]; Northern Thai: ᩮᨾᩥᩬᨦᨩ᩠ᨿᨦᩁᩣ᩠ᨿ: Mueang Jiang Hai; (Lao: ເມືອງຊຽງຮາຍ,Lao pronunciation: [mɯəŋ tɕʰiəŋ haːj]) is a city in Mueang Chiang Rai District, Chiang Rai Province. Chiang Rai is the northernmost large city in Thailand. It was established as a capital city in the reign of King Mangrai, in 1262 CE. The city was founded by King Mangrai in 1262:208 and became the capital of the Mangrai Dynasty. The word ‘Chiang’ means ‘city’ in Thai, so Chiang Rai would mean ‘the City of (Mang) Rai’. Subsequently, Chiang Rai was conquered by Burma and remained under Burmese rule for several hundred years. It was not until 1786 that Chiang Rai became a Chiang Mai vassal. Siam (Thailand) annexed Chiang Mai in 1899, and Chiang Rai was proclaimed a province of Thailand in 1933. There are currently no rail services to Chiang Rai as the railway line from Bangkok ends at Chiang Mai. There have been talks of extending the rail line from Den Chai to Chiang Rai in the near future, but this is unlikely to happen as the city's population is well below 1 million and there aren't as many international tourists visiting Chiang Rai as Chiang Mai. Also there are no major industrial complexes in the region as it is largely a rural economy.